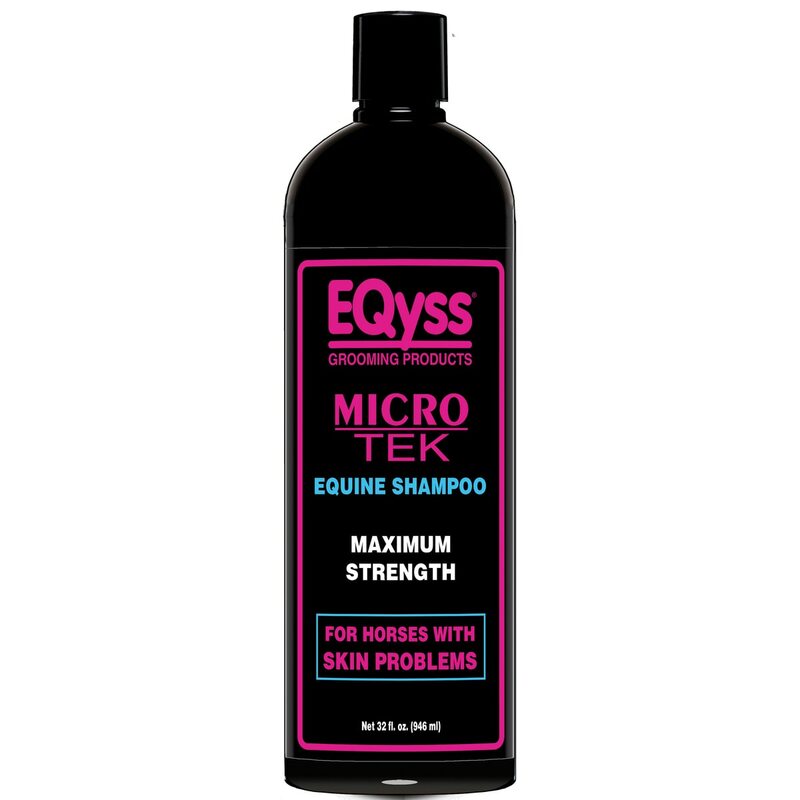 Eqyss Microtek Medicated Shampoo is the fastest acting, most effective shampoo ever developed! Aids in the control of problems upon contact with a trademarked formula developed from NASA research on the decontamination of astronauts. Combines ingredients to create the healthiest environment for healing. Veterinarian recommended. Will not burn or hurt open wounds. Environmentally friendly. Contains no soap or harsh detergents and soothes on contact. Put 2 or 3 ounces of MICRO-TEK Shampoo in a bucket, wash entire horse as you normally would. Leave shampoo on 2-3 minutes before rinising. Then put some shampoo on a wet sponge and wash affected areas, leave on 5-7 minutes and rinse off thoroughly. Repeat shampooing weekly. EQyss ELITE Sulfate & Paraben Free Conditioning Shampoo is infused with the perfect blend of oils & extracts that leave your pets coat clean, moisturized and radiantly beautiful in one easy bathing routine. Tropical Berry Scent. Eqyss Microtek Medicated Shampoo is rated 4.9 out of 5 by 60. Rated 5 out of 5 by 20079010SM from Works Fast Used this on my horse and worked great. Highly recommend. Starts working after one use. Rated 5 out of 5 by Michele from Worked Wonders I have always been a fan of Eqyss products but when my horse's hives turned into fungus, this seriously saved the day! Bathed him all over in it and immediately saw a difference. He was instantly so much more comfortable. Mild yet gets the job done - my hands didn't have the drying effect other shampoos leave on them after bathing and a little goes a long way! It rinses well and you cannot beat the smell of any of their products! I will definitely be buying more! Rated 5 out of 5 by KrisCVT from Very impressed. I wanted a shampoo that did a little more than just "clean". Although my horse does not have any skin issues, I do sponge him frequently, and bath him often so I wanted something that might alleviate any possible issues. The description of this shampoo seemed to be what I was looking for. Since it was getting to be the end of "bath season"...I have only bathed my boy with it once so far. I was truly impressed- his coat was very shiny afterwards, and it seems to be a quality product. Rated 5 out of 5 by rosehomes from Losing face hair My warmblood loses facial hair every summer, mainly around his eyes. Possibly from his fly mask (use the Cashel with ears) which he cannot go without due to living outside full time or possibly some type of fungus. The vet is not sure. Trying this shampoo along with the same manufacturers hair conditioner to get hair to grow back (which is awesome). Have been using for two weeks and the hair is growing back! Rated 5 out of 5 by Janine9499 from Very effective and gentle. I use this shampoo periodically as preventive in the warm, humid months because it's so effective against fungus. I also use it as a face shampoo for all their baths because it's gentle and doesn't seem to irritate. I used to use baby shampoo on their face, but this is way more effective and seems just as gentle. The only con is that is doesn't leave them shiny like their conditioning shampoo does. But a small price to pay for this great product. Rated 5 out of 5 by Ngt16 from Sooths on contact as it says! I bought this a few weeks ago for a very itchy and flaky mare. In addition to putting her on an antihistamine, this made her visibly more comfortable immediately. Rated 5 out of 5 by horsegrl30 from Great for problem prevention My mare usually has a beautiful coat, but in the summer the heat and humidity always make things unpredictable. I like to scrub her with Microtek shampoo (and follow up with the Microtek spray) a minimum of once a week to keep bacterial and fungal growth at bay. It lathers nicely, smells great, and leaves her very fresh and clean without stripping her hair or over-drying and irritating her skin. Works great for prevention, as well as for correcting skin problems. Rated 4 out of 5 by Working student from Great product! Love it, works great for keeping scratches in check, only wished that smartpack very also carried the gel and spray version of this product. Rated 5 out of 5 by Daisy from surprise clean and great smell This product really did deep clean my donkey's skin and already his bacterial skin condition is improving. I was surprised at the pleasant smell as well as how well this shampoo cleaned his coat & skin.